Love the story about Peter! Sewing school is what I need to attend to get better at hand sewing! Going to a very feministic school, sewing was not offered but I do wish there was someone in my life who could teach me to be neater when I hand sew! 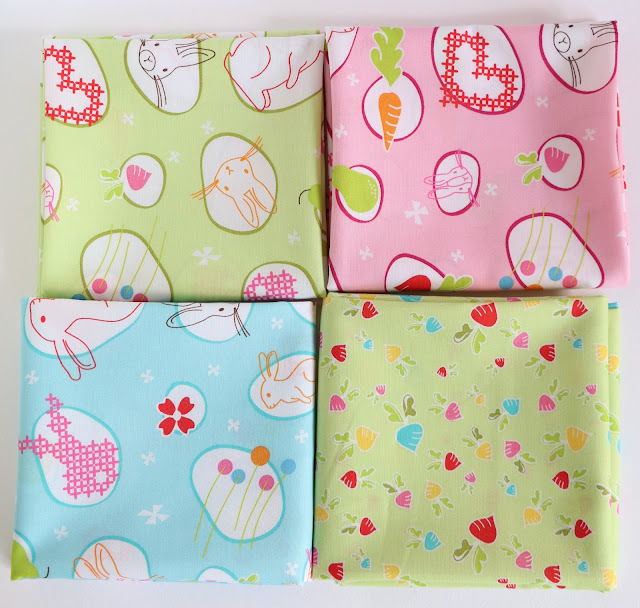 I love the fabric, especially the cross stitch bunny! Sewing school reminds me of getting an D in GCSE textiles. I was really upset because I thought my projects were great! Your bunny fabric is gorgeous, Jodie. I love your story about Peter. I can't remember any boys being in my textile classes. Sewing school makes me think of the dreadful floral Capri pants I made at high school. They looked so good on the drawing in the pattern packet! One leg was shorter than the other and the fabric I chose would have made Mrs Doubtfire's dress look drab. "Sewing school" was my experience of being in year 7 (30 years ago), when we had to practice sewing on a treadle sewing machine to get our 'sewing licence' (straight lines, wavy lines & a circle), and only when we were deemed licence ready were we 'let loose' on the electric machines. Mind you, this probably wasn't a bad thing really as my class neighbour got a needle stuck fast in her finger at one point later in the year! It reminds me of when I was 10 years old when I took sewing class. It was in the summer and I made a dress. Thanks! I knew exactly what sewing school conjured up for me. Our teacher was rotund with a heavy Scottish brogue which made saying "back stitch on the back" hilarious to a bunch of 12 year olds. She had a shelf bosom and regaled us all with tales of sewing her own bras. I am amazed I ever returned to sewing. Fuckups! My first sewing school saw mistake after mistake after mistake. I so wanted to sew and I was so crap. I'm not sure how I ever persevered or how I ever learnt. I'm sure my teacher was given a pretty white straight jacket after she was done with me, and she's still rocking quietly in a corner, muttering to herself. Ugh. I hated sewing class. Had to sew a whole entire outfit and had never even touched a sewing machine. I basically forgot everything i learned in sewing class and had to teach myself how to use the sewing machine when i got one later in life. I think sewing class would have been a lot more fun if we were making quilts lol. When I went to grammar school in the 60's we were only allowed to do sewing and cooking in the first year. If they thought you were bright you ended up studying Latin instead! The first thing we had to make was a gingham apron. My friend cut it out wrong so there were two pieces so we swapped and I matched the squares and sewed it together. The teacher told me off for not asking for more material to start again and I was very indignant at the waste and that she did not comment on how well I had matched the gingham! Probably just as well I didn't continue in her class! Mum and my aunt's taught me to sew, knit , crochet and cook and these are my best skills! I spent a lot of time outside of class too, supposed to be a punishment, they were the best bits of some of my school years. Sewing class -I actually didn't get kicked out of that class and remember one weird shaped bag but not much else. Reminds me of my Year 8 sewing class where one of the boys overestimated how close he needed to get to the machine and caught himself in the eye as soon as he put his foot on the pedal. That, and the gorgeous handkerchief tops we made. Now, I want to make one of those cute bunnies on the book cover. Laughing at your story about Peter... He got what he deserved! Sewing class at school... I hated it! I learned how to SEW in SCHOOL from a Catholic nun in a black habit. IMHO he deserved it and he should have been the one punished. I already knew how to sew before I did sewing at school thanks to my Nana and mum. So sewing at school was fun (and still is most of the time!) I was that "A" student. I do remember fondly my sewing teacher it would be great to bump into her know and talk on a different level - but I doubt that is possible high school was over 30 years ago! Thanks for the chance going to google myself and yes I may have had a glass of red! Ah sewing school... someone teasing me and me hitting my hand down on the table hard, and getting a big darning needle threaded with wool right through the palm of my hand and out the other side. Still sewing though more careful about loosing my temper. Ha ha. I started teaching sewing classes last fall, and its fun to see students gain confidence and skills. thanks for the chance. We only got 1/2 a year for sewing. :-( But I loved every minute (well, except the one where the teacher said in front of the whole class, that my back was too long for a short person). I made a dress, t-shirt, jeans and a stuffed dinosaur. And we had no boys in the class. Which was a good thing, because I would have decked Peter just like my brothers taught me. Sewing School makes me think about my girls' sewing book and that I need to work with them on it more. sewing school means to me that we should be teaching more of our grandchildren the fun of sewing and quilting!! "Sewing school" brings back good memories of my Mom teaching me to sew on her Featherweight! 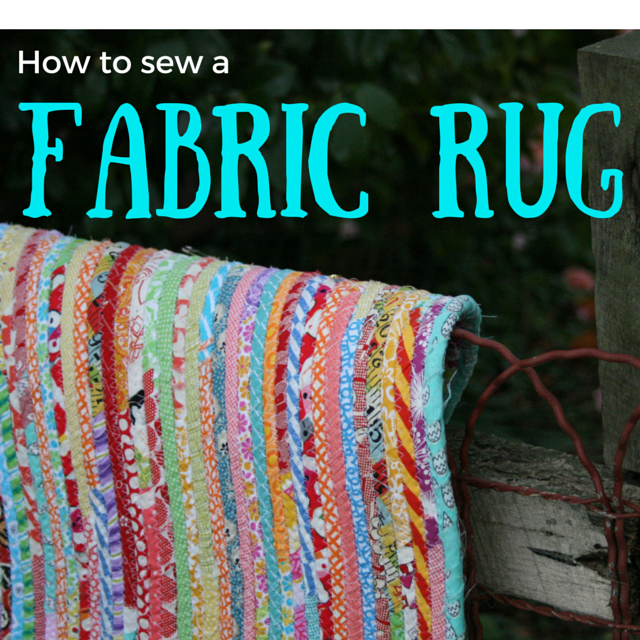 I loved sewing and I loved buying fabric - and I still do! If 'sewing school' exists I was definitely (and still am!) homeschooled haha! sewing school would be awesome! Wish I could go! Sewing with Miss Pearl (Oh my goodness - that was 43 years ago!!!) I hated it and it was the only subject I ever wagged. Pretty funny to think that sewing is my major addiction now. In elementary school, my brother made a felt pin cushion, filled with oatmeal. I made a gym strip bag and I remember my teacher commenting on how neat my stitches were. Sewing school: In Year 8 I spent a lot of time sitting under the big cutting tables reading fashion magazines "for research" or wagging class. Unsurprisingly I only completed one item in the entire year and received an F (back in the days when schools used to give them). I've always wondered what my home ec teacher would think if she knew I now love sewing so much I have a craft blog. I love the bunnies fabric, so cute.. Thanks for sharing the Peter story. I learn my sewing from my mum, so i follow her order all the time else I will be punished. 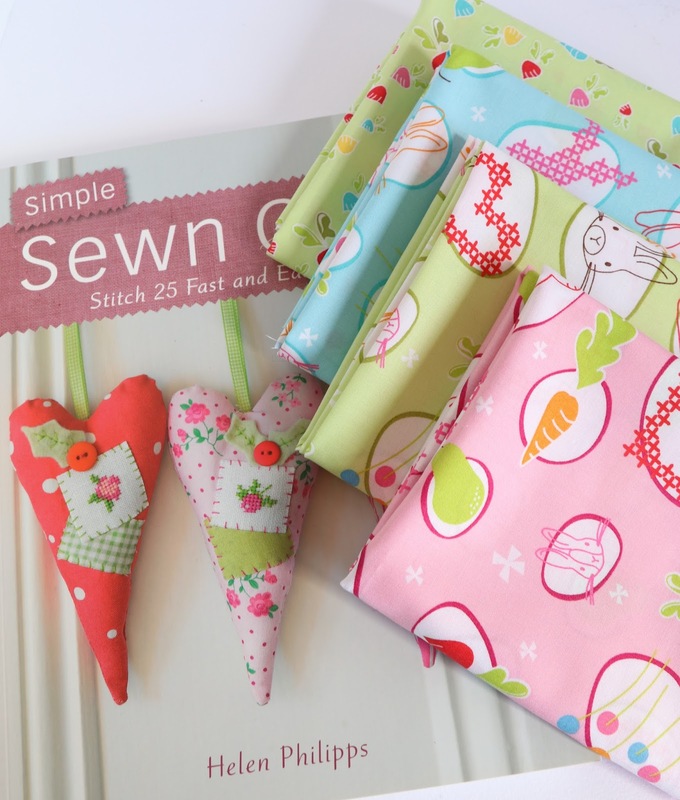 Helen makes such pretty projects and your bunny fabrics are delightful, Jodie. Sewing school - oh the memories (and not good ones). Like the pyjama pants legs I managed to (wrongly) stitch together AND upside down, and the cookery apron we had to make and chain stitch our names on. Never ever imagined I'd be any good at sewing. 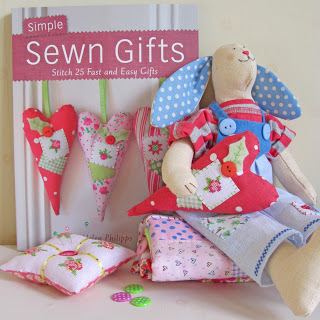 Cute book and gorgeous fabric! In Grade 9 I was made to sit the "Sewing Theory" exam even though I wasn't doing the subject (I was doing Tech Drawing) - just because I was a girl. I aced the exam - got 3rd top in the class for the exam!! Sewing school makes me think of the classes at school where I never actually did any sewing, it was things like tie dying and chopping the legs off jeans to make shorts! I didn't get into sewing until a few years after I left school! I never had sewing school I took auto mechanics. It was a rural thing. That said I love watching Nancy Zieman and I wish there were more quilting shows on TV. Making an apron by hand in grade six back in the fifties. What a lot of work that could have been done much quicker by machine. Sewing school takes me back to early high school when I took us an entire term to master the art of making 1 pillow case. Surprisingly though, I did continue to sew but not useless things like that, I now stick to softies etc.... PS the quick unpick was probably far nicer than stabbing him with scissors! When I think of sewing school I think of playing with fabric and creating something unique. I would love to be going to sewing school. Thank you for the giveaway. "Sewing school" gives me the shivers, I spent all year unpicking because of course you weren't allowed to do left handed cross stitch. I just love Helen -- so glad you found her! I went to sewing school in 2nd grade...after having my mom teach me basics for 2 years. Always have loved sewing, and las year I taught sewing to middle schoolers. I hated home economics at school, really hated it. Why would anyone waste their time doing that stuff, said me. Hmm, nowadays can't get enough of it. Ps I hope Peter's grabby hands were caned!! I never had a sewing class I would have loved that though. I have been thinking about taking some class though now to improve what I can do now & to learn new techniques. I think I would like sewing school better than I did regular school - any excuse to be sewing is good with me! Sewing school - My refusal to tack/baste my seams always ended in an argument and often I was sent out of the classroom to reflect on my attitude. I could not see the point of tacking a 5" straight seam, especially as I'd been sewing with my mother since I was eight years old, and would often remind my teacher of that (she knew my mother and how experienced she was). Luckily I still love sewing, but looking back, I'm surprised my teacher didn't throw her scissors at me; I was the biggest pain in arse student, I'm sure. When you say 'sewing school' I remember the rather large Mrs Beecham, possessor of a magnificent bosom, who made me unpick, redo and unpick the hem of a hanky over and over again until any desire to sew was beaten out of me for a good deal of time. She also took it upon herself to stand up and bellow 'Amazing Grace' at my wedding just because she had always wanted to sing at a wedding. There have been many times lately when I wish I had paid attention during Needlework in Form 2. Sewing lessons for young girls, a much needed thing. Haha sewing school makes me think of year 7 textiles an apron wit a white smiley face as was the rage in the late 80's. These days sewing school is often endless youtube videos with a commentary that goes a little like "and the first thing you're gunna wanna do is you're gunna wanna take each of those corners and you're gunna wanna fold them so they meet up just like this, y'all see how I just folded that, and then you're gunna wanna sew along that edge from about here to here ..."
Sewing school reminds me of our home ec class in high school where I made my first and last apron, very useless as I have never worn one! I got "kicked out" of home economics because I corrected the teacher on her mock French seam, the principal had to obtain special permission for me take industrial arts with the boys because I wasn't allowed back in her classroom. Poor Peter! I was thinking you were going to tell us you married him! Ha! Sewing School to me means Home Economics in junior high with Miss Wilhelm. How I loved her and her endless patience teaching 30 girls how to sew! She thought I had some talent, so allowed me to help other girls who would rather use the scissors to trim each others hair than cut fabric. How very generous of you! Sewing School actually brings nothing to mind because while I did take home ec, there was no real sewing involved, no machine sewing, anyway. We did embroidery and there may have been knitting. There was a year of cooking with a teacher who definitely did not like me. My mother did teach my some basic sewing skills and I have her very old treadle machine. Good for you! re Peter ... I don't have great memories of sewing in Home Ec. My mother's machine, which I used for homework, was a beast! But now I look forward to anything that could be called Sewing School - classes, works shops, quilting, garment making ... bring it on! To me, sewing school means "home ec" class - short for home economics, which was a course the girls took in junior high, so that we could learn the basics about cooking and sewing. This class literally changed my life, because I discovered how much I LOVED sewing. (Cooking, too, but many more people enjoy that on a daily basis.) My grandma noticed that we had this sewing thing in common, and from that moment on, she did all that she could to encourage me. 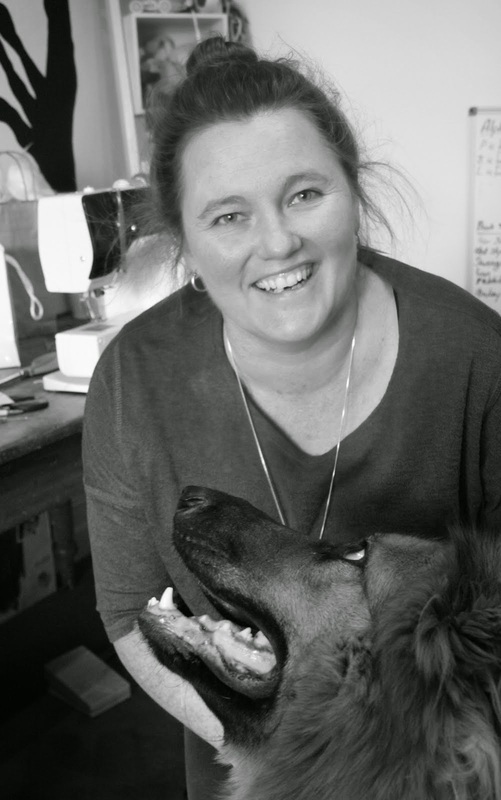 I'm also a big fan of Helen Phillips - I love her style and projects. Your blog is lovely, too, and I've just happened on it...will be coming back often to say hello! What a lovely giveaway! "Sewing school" instantly brings up a black and white image for me, of rows and rows of old-fashioned school desks, with young'uns each stitching embroidery on a hoop, a look of intense concentration (tongue poking out the side), with a stern matronly teacher at the front of the class keeping an eye on them. I have no idea why, as it is almost as quickly replaced with an image of adults learning new skills through blogs and youtube videos, and then sharing those skills and that inspiration through Facebook and local community groups. Sewing school is fun! Then and now! In sewing school, 8th grade year, I had the best and most patient teacher. My mom even went and bought a Bernina (not sure on the model) just like we used in school. She must have known how much I loved sewing. I stopped sewing for a long time. Then 15 years ago I started making blessing blankets and camping quilts. My mom had a massive stroke and we ended out moving in with her to take care of her. She passed away in 2014. I inhereted her 1800's sewing machine and with some of my money I purchased my Sapphire 960Q and many other items we use for quilting. I also received 2 huge boxes of material. I thought a patched quilt or 2 and one day I want to make a crazy quilt. So many wonderful memories in all that material. It seems universal that sewing teachers spent far too much time on disciplining students. Having taken a summer school course at age 11 prior, I was sorely disappointed when regular school started. My 7th grade sewing teacher was named--I kid you not--Miss Cotton. I think she sent someone to the principal's office every other day. She was an "inside the box" type teacher and made me completely redo an entire skirt waistband after I had creatively (I thought) added some fabric ties to the waistband I had accidentally trimmed even instead of overlapping at the closure. I've never forgotten it! My older brother took "Bachelor Skills" in 9th grade and sewed a chef's apron. This was in the 70s when Title XIII first made it illegal to have classes only for boys or for girls. Luckily I had a great teacher in high school and learned a lot. I don't think sewing is taught in schools at all now :(. Sewing school reminds me of my time at school when I was about 8 years old. The girls in my class all sewed a skirt for themselves (I can't remember what the boys had to do). By hand of course! Mine had lots of little blue flowers on it and when we moved shortly after it got lost which still makes me sad. I can remember that I didn't mind at all doing the hand sewing, actually I was quite happy with it and it has remained so till today - about 60 years later!